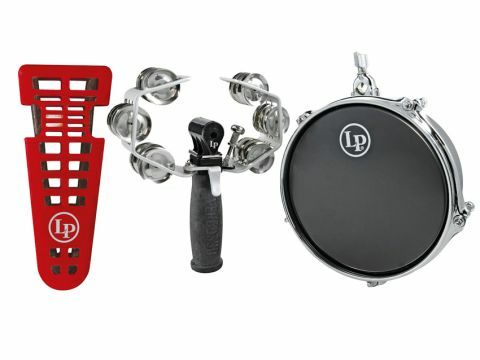 LP has once again brought something brand new to the percussive table and these innovative additions will challenge us to adapt and even improve our playing techniques. Innovative and practical designs. Good quality sounds. The One-handed Triangle is a collaboration between LP and percussionist Doug Hinrichs and features an ergonomic vented plastic design that is not only comfortable to hold but houses a large V-shaped triangle with a sliding steel ball acting as the beater as it strikes each end of the bars. You can play the triangle whilst resting your thumb and forefinger on the bars in the 'cut-out' sections, which gives you the familiar muted triangle tone. By taking away contact with the bars it allows for a fully 'open' tone and, with a little practice in controlling the striking action, you'll soon be in business. The Percusso was designed in Australia by Hybrid Percussion and gives you the chance to perform tambourine and jam-block sounds simultaneously. Its lightweight alloy design is effortless to play thanks to the comfy oversized rubber handle and the 'trigger activated' block is easy to play whilst performing a tambourine part. The stainless steel jingles can be popped out so that you can customise the instrument for a particular musical setting and the block's beater is height-adjustable too. The 'Micro Snare' is one of those perfect little additions to one's percussive set-up and would be great for drummers and percussionists alike. Available in 6-inch or 8-inch diameters (both 3¼" deep), these single-headed steel-shelled auxiliary drums have a snare mechanism that pulls a 'cut off' set of snares up under the head with a twist of the lever. The Micro is mountable on most common bar type holders between 3/8-inch and ½-inch diameters and sports attractive tube-style lugs and a triple-flanged hoop. Both the One-handed Triangle and the Percusso offer authentic full-sounding tones that you would find in the usual incarnations of these instruments but with generally more clarity and overall volume. The 'block' tone on the Percusso has an authentic and surprisingly cutting wood-block tone with more than enough volume, given its size. The one-handed triangle has a shrill, voluminous traditional tone and, although it will take time to get used to, it does give you the advantage of being able to multitask. The 8-inch Micro Snare is an easy-to-integrate addition to any drum kit and would take up little space while affording the player new and highly cutting tones that would suit most styles of music. The snare sound was a little limited but the snare-off option was timbalito-esque and could simply take your head off! Triangle execution can be more than a little tricky at the best of times (even using two hands) so LP's One-handed Triangle is both intriguing and practical. Likewise, the Percusso's trigger-activated action and ability to customize its sound and performance options will appeal to many, as will the cracking Micro Snare.